Red pine, Pinus resinosa, is a fairly common tree in our area. It typically reaches sixty to seventy feet in height with a trunk diameter of a foot or more. 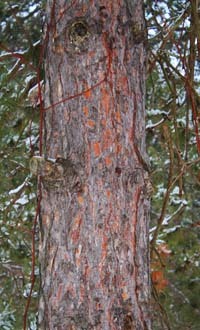 The bark has a reddish cast and consists of thick, scaly plates. The cones are small and egg-shaped. The two dark-green needles in each fascicle (bundle) are three to six inches long and they form in clusters at the ends of branches. Pinus resinosa prefers dry, sandy soils although it can do well in many soils provided there is adequate drainage. In North America it is found principally in the Great Lakes area and eastern Canada. In New York state, it grows wild in the higher elevations- typically the Adirondacks and Catskills. In our region it grows wild in the driest, steepest, most exposed south- and west-facing slopes. Northern Pennsylvania is the southern extent of its range. It germinates best on fire-cleared areas and its thick bark affords it a level of protection against fire. Although less common, the imported Austrian pine (Pinus nigra) can often be found growing along with our own red pines. This European native resembles P. resinosa and was similarly planted in our area years ago for its timber value and fast growth. As the Latin name suggests, Austrian pine is also called "black pine". Red pine, on the other hand, is also known as "Norway pine". It is indigenous to North America, not Norway, but may have gotten this common name due to confusion with Norway spruce by our original English colonists. 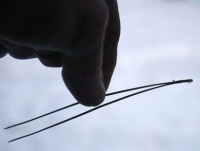 The way to tell them apart is to take a leaf (needle) and bend it in half. If it snaps in two it is a red pine; if it flexes without breaking it is the Austrian pine. For years I could never remember which was which so I came up with a mnemonic: "If you snap your fingers they will eventually turn red." Austrian pine leaves are usually a little longer than red pine, too. 4. Eastman, John, The Book of Forest and Thicket, Stackpole Books, 1992, p160-163.